How does the JNNURM/RAY imagine the poor, the space of the slum and their relationship to the city? How does awarding property ownership make the poor slum dwellers and the city bankable? Are there any interlocutors that influence this program? My following posts shall discuss these questions. "My dreams of owning a house have come true!" Creation of the Bankable poor. The Plans aspiration to create a class of bankable poor who use property as collateral bears a strong resemblance to the ideas of right wing economists like Hernando Desoto. It is reported that in 2009 when Kumari Sheilja was sworn in as the Minister for housing and poverty alleviation the Prime Minister gifted her Desoto’s famous books, “Mystery of capital” and “The other Path”. When Desoto visited the country in 2010 he was actively consulted for RAYs program, a service he gladly extended. In the Mystery of Capital, Desoto argues that the poor hold trillions of dollars in real estate assets. However they hold these assets in defective form as they are settled on land whose ownership tights are not adequately recorded. He states that “because these rights are not adequately documented, these assets cannot readily be turned into capital, cannot be traded outside of narrow local circles where people know and trust each other, cannot be used as collateral for loan and cannot be used as a share against investment”. He calls this a “legal apartheid” where the cities poor are kept out of formal systems of asset trading. This he notes is very different from the land records in the west, where every bit of property is recorded in terms of its formal ownership, the systems of ownership are standardized and there is no ambiguity about who can trade these assets in what manner. His solution to the problem is simple he suggests that the wealth that the poor have settled upon must be legalized. This is not a proposal to transfer wealth from the rich to the poor, but simply a proposal to legalize what they have managed to take hold of. To begin the process of converting informal wealth to formal wealth Desoto prescribes that the squatters settlements should be mapped and correlated to the individual “owners” and then ownership rights must be transferred to them. He argues that once included into the formal system of property ownership the poor can trade assets, use them as collateral for a loans and prosper like the rest of the people who own formal property. The RAY plan is in line with Desoto’s advice on documentation and defines strict guidelines for mapping the slum and its residents. The planning methodology instructs city planners to make detailed records of the space of the slum (spatial dimensions, exiting infrastructure, etc) and the body of the slum dweller (identity, socio economic data etc). Space is mapped through “state of the art” cartographic, GIS and Management information systems that attempt to integrate geo-spatial and socioeconomic data in one panoramic layered plan. The body of the slum dweller is biometric mapped and correlated to the spatial data. The guidelines instruct that the data must be collected with the help of community participation through urban local bodies to assure accuracy. There are no guidelines about what kind of data should or should not be available publically or how the public shall access or be restricted from this data. There are similarities in the way in which Desoto and RAY imagine the slum dweller and the slum. Both imagine the slum/squatter settlement to be a solution to the crisis rather than a symptom. The slum is imagined as a fixed geographical space can be accurately and panoramically mapped in terms of dimensions and infrastructure. Both attempt to flatten and simplify the kinds of complex tenure system that exist into simpler forms so that the property might become easily and more importantly universally tradable and not necessarily caught up in local politics. The slum is mapped for its tenure, typological aspects of the slum that are intrinsic to the ways of living and earning livelihood are not issues of concern or data collection. The slum dweller is imagined as a permanent resident of the space that can be counted and biometrically mapped. He/she is not a flotsam or jettison, but rather an entrepreneur that must be included into the formal market systems. Like Desoto, the state too envisions that giving the poor slum dwellers property ownership shall enable them to convert wealth of property into income. The assumption is that, when the land value of the city goes up their wealth shall increase “formally”. They shall have the freedom to trade their property and hence reap greater benefits from the cities development. He/she shall have the capacity to take on debt, invest the money into a business, convert it into profit and repay the loan as well as produce enough surpluses to survive and rise out of poverty. This is how the state attempts to make the poor “Bankable”. In other words the plan attempts to give the slum dwellers something “secure” to risk. As Desoto would put it, if the poor have something to lose they are taken seriously as contracting parties. On the other hand “people with nothing to lose are trapped in a grubbery basement of pre capitalist world”. Tenure ship enables the poor to access the formal systems of banking and at the same time increases the number of “secure” clients for the banking industry. The plan also ties into the states larger neo liberal stance of being a facilitator for development rather a provider. The poor are encouraged to take on entrepreneurial activities to bootstrap themselves out of poverty, so that they do not depend on the state for jobs. Nikolas Rose calls this the process of self responsiblization of the poor. If a poor slum dweller fails to tap into this system, the burden of failure falls on the failure of the individual who could not be entrepreneurial enough. My next post will concentrate on the idea of the bankable slum free city and the final post will conclude with a reflection on this mode of planning. KS has played an active role in executing the Rajiv Awas Yojana. She was also elected president of UN Habitat between 2007-2009. To be exact 9.3 trillion in the year 2000! Hernando De Soto. Mystery of Capital. 1st ed. Basic Books, 2000. Page 6. Print. Hernando De Soto. Mystery of Capital. 1st ed. Basic Books, 2000. Page 40. Print. This also forms a part of the larger UIDAI project that is initiated by the Government of India. 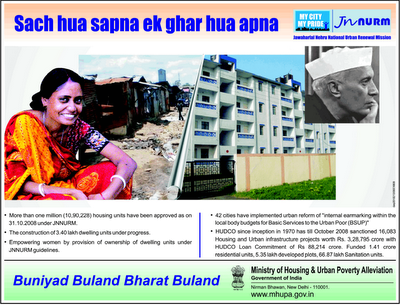 Government of India, Ministry of Housing and Urban Poverty Alleviation. Rajiv Awas Yojana, Guidelines for Slum Free City Planning. Page 3-7 Print. Solomon Benjamin notes this in the governments reaction to slum settlements in Bangalore as well. Which might not be the case as a lot of people use the city in cycles and do not permanently reside in the space. One can argue that the RAY plan says that the state must provide tenure for the urban poor (which can be in many forms) but does not categorically suggest that slum dwellers be given ownership of the space they own. However the RAY plan asks the state governments to gives primacy to ownership models through public private partnerships where ever possible. Also, in his speech the Prime Minister alludes to making poor bankable by giving them property rights at affordable rates which they can use as collateral. Hernando De Soto. Mystery of Capital. 1st ed. Basic Books, 2000. Page 56. Print.